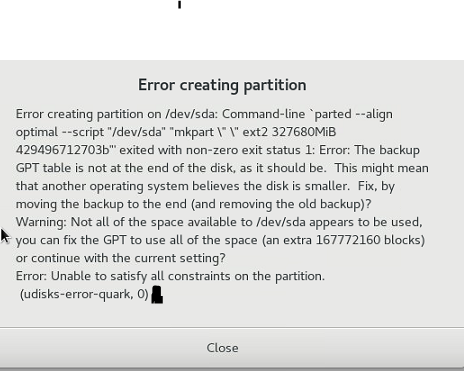 Error creating partition on /dev/sda: Command-line `parted –align optimal –script “/dev/sda” “mkpart \”\” ext2 ******MiB ************b”” exited with non-zero exit status 1: Error: The Backup GPT table is not at the end of the disk, as it should be. This might mean that another operating ystem believes the disk is smaller. Fix, by moving the backup to the end (and removed the old backup)? Warning: Not all of the space available to /dev/sda appears to be used, you can fix the GPT to use all of the space (an extra ********* blocks)( or continue with the current setting? 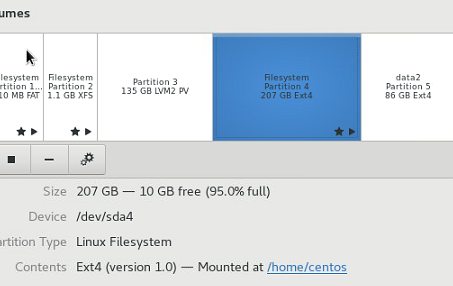 Use gdisk and verify partitions are correct with p, and use w to write the partition table. If not correct just use q to quit. That should update primary, backup & protective MBR.